Sometimes you want a taco for lunch. Other times you want a taco for dinner. But when you want that taco at 3:25 in the morning, where are you going to go? The answer is Erick’s Tacos. 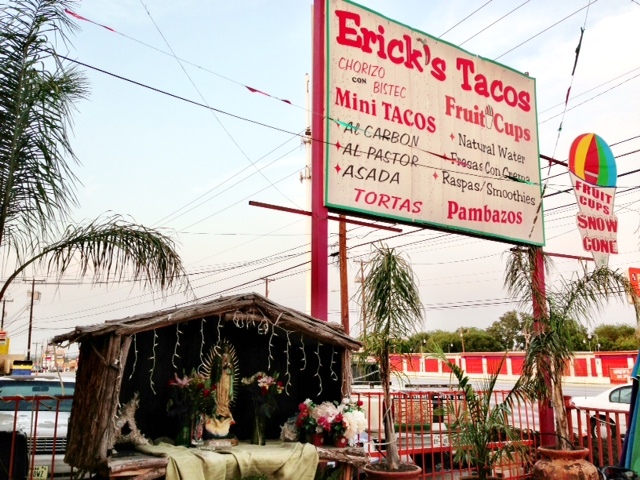 Located on Nacogdoches Road, just a little north of Thousand Oaks, Erick’s Tacos is one of the greatest gifts to the tortilla. Initially begun as a late night taco truck, the empire soon spread to include paletas, raspas and a fruiteria, later adding a full on sit down restaurant. Looking over the restaurant is a shrine to Virgin of Guadalupe, and the whole feel is more reminiscent of being in a border town instead of on the Northside of San Antonio. I learned of Erick’s Tacos when someone posted about it on Reddit several months ago. I bookmarked the page, and since then have seen several fans raving about the tacos, so I was excited about the chance of finally getting out there. Erick’s Tacos offers it all, until 4AM! I recently returned from a trip from Peru and had yet to have had a Tex-Mex cheese enchilada. In spite of the fact that Erick’s is known for their street tacos, I was craving that enchilada. Fortunately, I was able to add several items a la carte so I could try a range of things: a cheese enchilada, al carbon street taco and a chicken breast covered in a Poblano sauce plate. 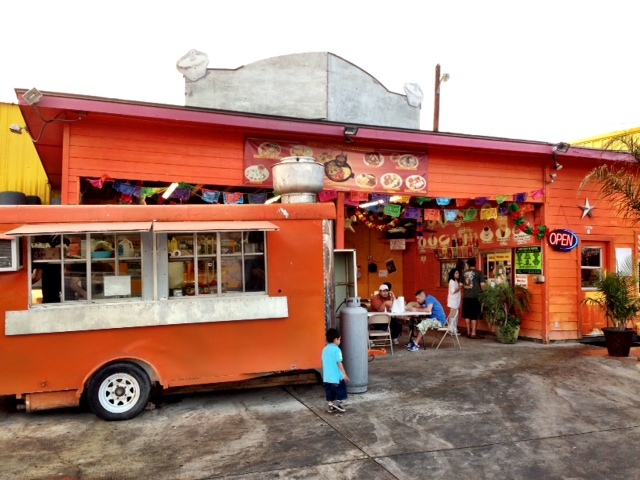 The Taco Truck and paleteria. But I am getting ahead of myself. If you go into the restaurant you will be served chips and three different kinds of salsa. The hottest red sauce is tasty and is more flavorful that spicy. But oh that green salsa! It is a creamy blend of peppers that is best described as being a kicked up version of HEB’s That Green Sauce. Be sure to have a drink close by – I opted for the homemade Jamaica agua fresca. If you are looking for a more adult beverage, note that Erick’s Tacos is BYOB. 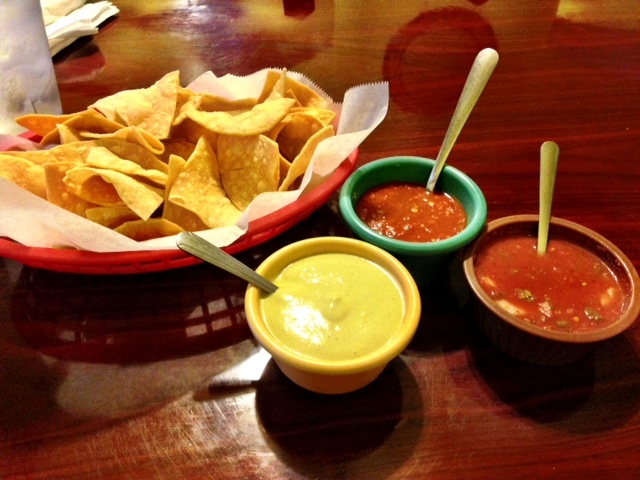 The green salsa is hot and addictive! Have an agua fresca close by. While the cheese enchilada looked simple, the sauce made it interesting. 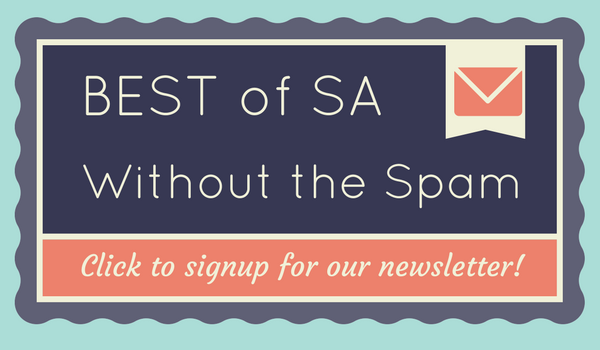 There are no chunks of meat in the sauce, but it is definitely a step up from your traditional Tex-Mex guisada gravy. The pechuga de pollo a la poblano had a chicken breast that was covered with a creamy green poblano sauce and topped with slices of fresh poblano peppers. The gooey white cheese helped tone down the spice of the pepper, and overall I found the sauce more savory than spicy. At first glance, the refried beans and Mexican rice look rather ordinary, but one again the looks seemed deceiving – they were both delicious. But the real reason to go to Erick’s Tacos is the street tacos. Quick glances on Yelp, Urban Spoon and Reddit will lead you to believe that the food truck’s tacos are superior to the restaurant. Tony, the owner’s son, told me that this was not the case. He cooks in both the restaurant and truck and says that the exact same meat is cooked in the exact same style. Tony believes that the preference for the truck is all in a person’s mind. Erick’s Tacos al carbon street taco – heaven in a tortilla. 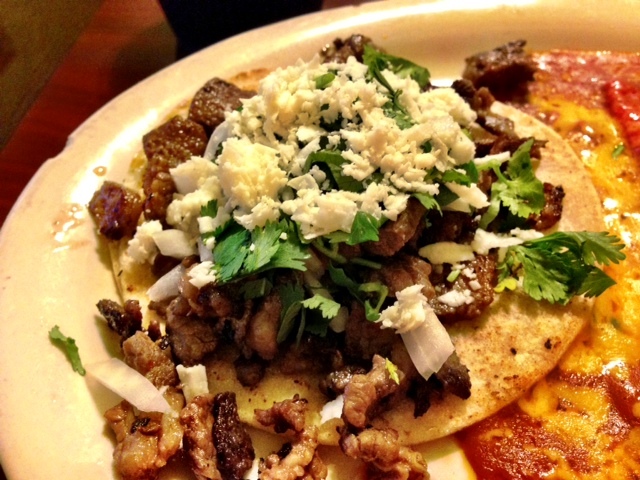 The al carbon taco came out on two small corn tortillas, had a generous amount of meat, cilantro and white cheese. The meat was spilling off the taco on the plate, and I picked up a piece and was immediately blown away. It was the right amount of crisp, flavor and chewiness. I squeezed some lime juice, topped it with the green salsa and chowed down. Erick’s Tacos al carbon street taco is heaven in a tortilla. At four tacos for five dollars, this is not simply one of the best values in town, but is also one of the tastiest.